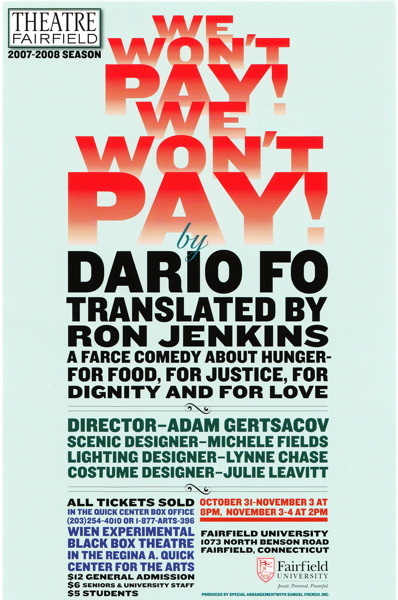 Fairfield, CT, October 22, 2007 –(PR.com)– We Won’t Pay! We Won’t Pay! is a social farce with a message. In the play, high prices have caused a revolution in the supermarket, with housewives stealing food from the market. When they get home, they realize they can’t tell their husbands where they got the food, and pretend to be pregnant. From this one simple lie, a farce develops so that by the end of the play nearly everybody in the cast (including the policeman, who looks suspiciously like a number of other characters in the play) has become pregnant.